The installation consists of a raised two-level construction made from scaffolding and/or wood, similar to structures that are used for temporary construction or archeological sites. The site of the work is entered via stairs to an upper level. 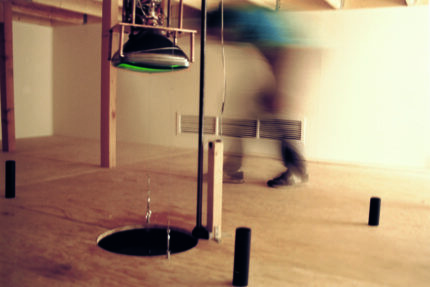 Located in the center of the space and mounted on the floor around a hole is an aluminum derrick. Positioned perpendicularly on top of the derrick is a beam of aluminum channeling which is motorized to rotate. Two 5-inch black-and-white monitors are mounted at the ends of the beam and are also motorized to spin. 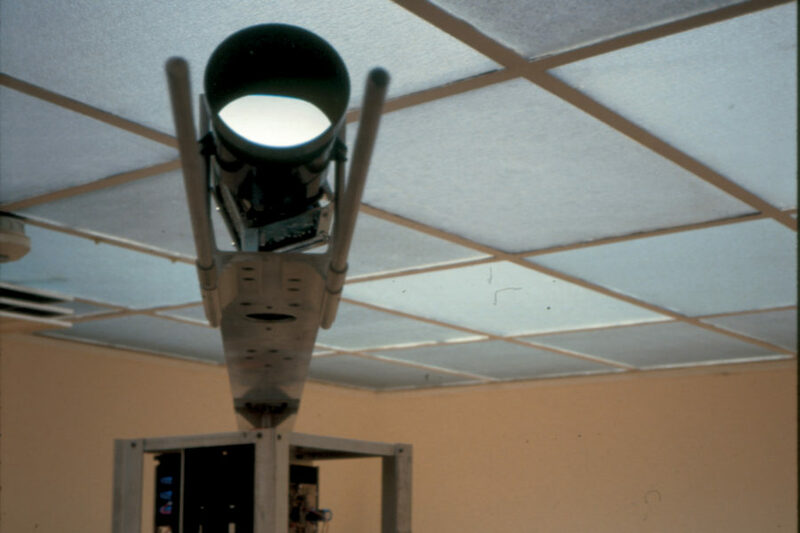 Extending out beyond the ends of the beam are video projection lenses that project images onto a narrow screen forming a circular band around the upper level. A second stairwell descends from the upper floor to the lower level of the site, the height of which is approximately four feet, forcing the viewer to crouch within the space, as if to get closer to the “source.” A green phosphor monitor, positioned facedown in an open frame construction made of copper, slowly moves up and down a shaft, which runs from the hole in the upper floor through an identical hole in the subfloor. It too is motorized to rotate, mimicking the movement of a drill. Visible through this lower hole, a dark liquid (mineral oil) of unknown depth appears to continue underneath the lower platform. Positioned at various points around the hole (or “well”) are three short black pipes. Viewers must crouch down still further on their hands and knees to peer into the pipes, which are focused tightly on a small areas of TV screens that are simply displaying white noise, but at extreme close-up one sees red/green/blue pixel clusters flickering intermittently. The entire rig is programmed according to the syntax of the image (the formation/ “reinvention” of the wheel and its subsequent resurrection, use, and demise). A complete cycle of the piece is as follows: The green phosphor shaft monitor begins to descend to the lower level. As it approaches the open hole at the middle level, it begins rotating, continuing down until it touches the surface of the liquid. After briefly stirring the liquid it reverses course and soon stops rotating. As the monitor begins moving back up the shaft, the reflection of an abstract circular image, mutating and changing on the monitor’s screen, is seen on the surface of the oil. When the monitor reaches the top of the shaft (the upper hole), it stops, as does the image on the screen, which has become an iconic wheel. The upper arm of aluminum channeling begins to turn, as do the monitors at its ends, which “spin” the projection of the wheel. After the wheels illusorily seem to “fall off” the spinning monitors, the arm comes to a stop. The cycle then repeats. The original title Mediarite was changed to DIG in 1992. The soundtrack and projection imagery for the work have been modified since the original installation in 1987. 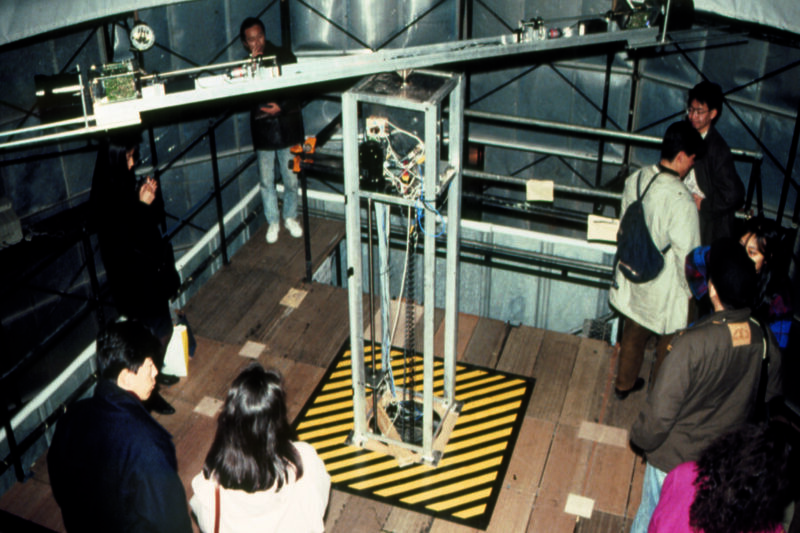 As installed in Tokyo in 1992, the soundtrack included political slogans such as “Promises / Problems / The Undisputed Leader / Class / Super Power,” etc. (referring to President Bush’s visit to Tokyo with representative of the American auto industry and the “car wars” between the U.S. and Japan), imposed over traditional Japanese Gagaku court music. The imagery of the previously almost “iconic” wheel became a single automobile tire. As installed in Dortmund in 2000, the image of the wheel was computer-generated. As it is “pulled” from the liquid, circular and symmetrical abstract patterns slowly metamorphose into a wheel. 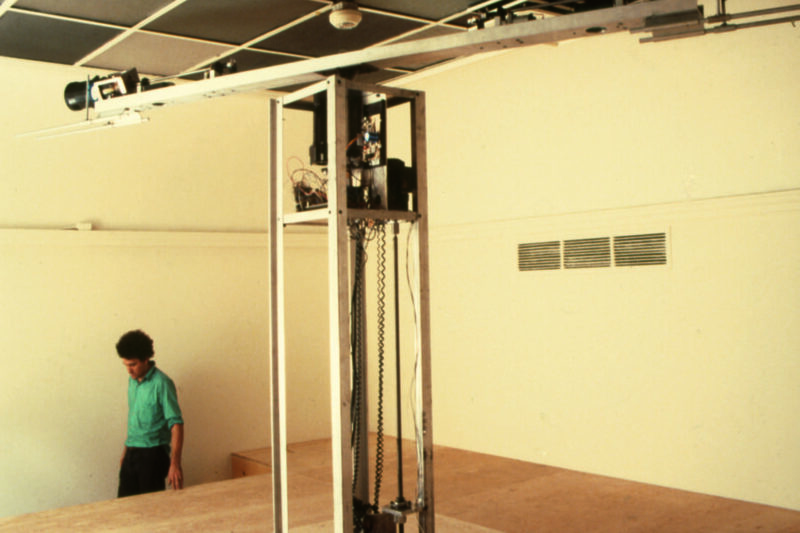 An example of this work was first exhibited as Mediarite at the Henry Art Gallery, University of Washington, Seattle, Washington, from August 3 – October 4, 1987 as part of the exhibition "15th Avenue Studio #2: The Mechanics of Contemplation." 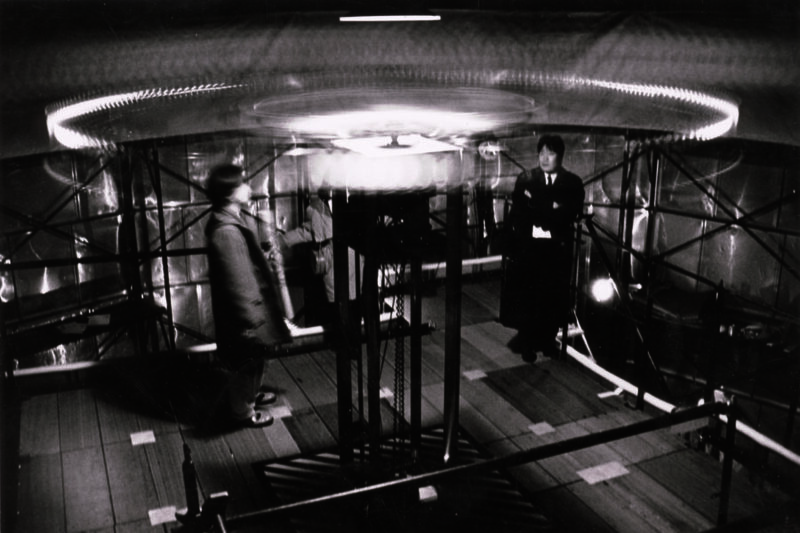 As DIG, an example of this work was first exhibited at the Japan 92 Video and Television Festival: Prospectus for a TV Art Channel, Spiral, Aoyama, Tokyo, Japan, February 1 – 11, 1992. “Vision Ruhr,” 235 Media, Dortmund, Germany, May 13 – August 6, 2000. Sarrazin, Stephen. Chimaera Monographe No. 10 (Gary Hill). Montbéliard, France: Centre International de Création Vidéo Montbéliard, Belfort, 1992, pp. 54, 82. (Including an excerpt from an interview with Gary Hill). Bruce, Chris. Gary Hill. Seattle, Washington: Henry Art Gallery, University of Washington, 1994, pp. 19, 33 – 39. Quasha, George and Charles Stein. Viewer. Gary Hill’s Projective Installations 3. Barrytown, New York: Station Hill Arts, 1997, pp. 8, 9. Chung, Yong-do. “Gary Hill: New Art Language Marking History of Reason. ” Art, Korea (October 2000), p. 145 (in Korean). vision.ruhr. Dortmund: Museen der Stadt / Hatje Cantz Verlag, 2000, pp. 180 – 185. Morgan, Robert C., ed. Gary Hill. Baltimore: PAJ Books / The Johns Hopkins University Press, 2000, pp. 221. Gary Hill: Selected Works and catalogue raisonné. Wolfsburg: Kunstmuseum Wolfsburg, 2002, GHCR 57, pp. 128 – 129. Gary Hill: Resounding Arches / Archi Risonanti. (Catalogue and DVD.) Rome: Ministero per i Beni e le Attività Culturali Soprintendenza archeologica di Roma, and Milan: Mondadori Electa S.p.A., 2005, pp. 148 – 149. Quasha, George and Charles Stein. An Art of Limina: Gary Hill’s Works and Writings. Barcelona: Ediciones Polígrafa, 2009, pp. 304, 305, 306 – 309, 576.